If you only visit Niagara, Canada to witness the majestic beauty of Niagara Falls, then you are missing out. I say this because there is SO MUCH more to see and do in the region than just visit the Falls. I’m from Ontario and am close enough that we can drive there in a reasonable amount of time. In fact, I’ve been vacationing in Niagara, Canada since I was child. It’s also the spot where John proposed to me and where my best friend was married. Whenever we are discussing travel and where we should go, I’m first to suggest Niagara. There is still so much that I want to do there despite my many visits! With the nice summer weather, I want to get outside and enjoy all the beauty nature has to offer. Niagara is the perfect spot for people who want to spend time outdoors with their families. 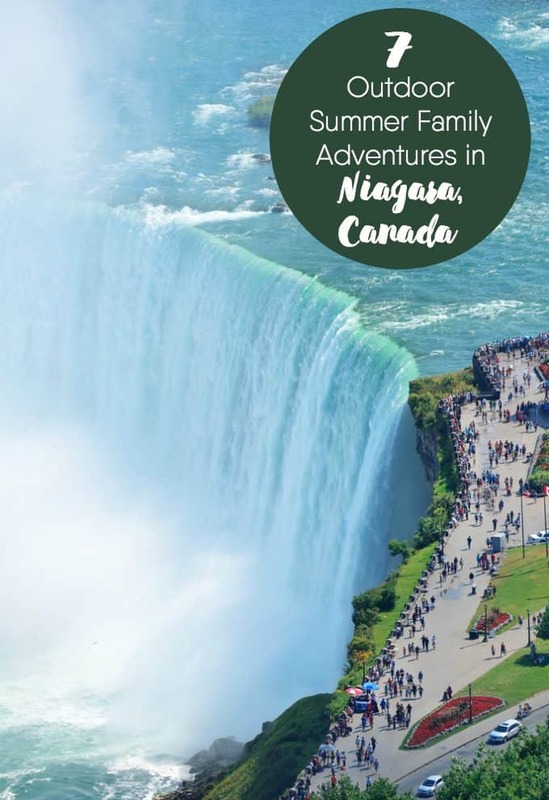 I’ve done a bit of research on the region and compiled a list of seven outdoor adventures you can do with your family this summer in Niagara. 1. Cycling on the Greater Niagara Circle Route. Bring your family’s bikes or rent some locally from Mac’s Bikes or Zoom Leisure Bikes. Either way, you’ll want them so you and your family can explore the diverse trail system. The trail itself is 140 km long and runs through a wide range of sights and attractions including the Fort George and Fort Erie, the Mud Lake Conservation Area and many vineyards, wineries and orchards. Discover a little history, get some exercise and take in the beauty of nature as you ride. 2. Cycling on the Friendship Trail. If you prefer an easier, more leisurely ride or your children are younger, this 16 km trail is for you. It runs parallel to the north shore of Lake Erie and features beautiful countryside scenery of farms, villages, watersheds and more. Bring your camera so you can capture photos of the Buffalo Skyline and historic Old Fort Erie. 3. Mountain biking in Short Hills Provincial Park. If mountain biking is more your family’s style, you’ll want to add this location to your itinerary. This popular park is home to white-tailed deer, coyote and meadow vole. Besides mountain biking, people come here to hike, horseback ride and fish. 4. Bird watching at the Wainfleet Wetlands Conservation Area. You’ll want your binoculars to view over 50 species of birds that call this unique wetland home. Expect to see yellow warblers, great blue herons, egrets, gulls, terns and sandpipers. Once you’ve had your fill, explore the fossils of plants and animals in the limestone of the Onondaga Formation. This area used to be covered by the Paleozoic sea around 300 to 450 million years ago! 5. Hiking on the Bruce Trail. This well-known trail is Canada’s longest and oldest foot path at a whopping 800 km. The southernmost part of it is in the Niagara region. Spend a day outdoors and enjoy the spectacular views of vineyards, farmland, woodland, waterfalls and lots more. On a clear day, you may even be able to see the Toronto skyline! 6. Golfing at the Niagara Golf Trail. If you love to golf, you’ve come to the right place. Niagara has the greatest concentration of golf courses in the country. The Niagara Golf Trail has seven golf courses for you and your family to have fun and enjoy the sweeping views of the region. After your visit, you’ll understand why this area is a premier golfing destination. 7. Fishing on the Niagara River. This turbulent river is home to a variety of species of fish. During the summer months, catch some walleye or small mouth bass and bask in the beauty of your surroundings. Consider hiring a fishing guide like Cast Adventures to show you the ropes and help make your day a successful one. As you can see there are many ways you can reconnect with nature in Niagara, Canada. You may initially go for the Falls, but you’ll end up staying for all the other experiences. Your family’s adventure awaits! Which of these outdoor adventures do you think you’ll enjoy the most? You might also like these summer songs. I’m from upstate NY and have never been to Niagra! These are all awesome suggestions if I ever get up there! I would love to visit the Falls sometime thanks for the tips ! I’ve never been to Niagara Falls, and would love to visit Niagara. These biking and hiking adventures sound very appealing, not just standing around looking at sites! Luv! I’ve never been to Niagara Falls, it’s been on my bucket list for a long time! I hope I will get to go one day!